Singapore's business credentials, ITV disses the Beeb, Apple's record profits. 1. 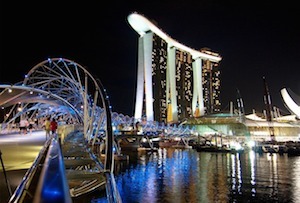 Singapore is the greatest place in the world to do business. 2. Someone at ITV really dislikes Bargain Hunt. 3. Apple made more than $1bn (£650m) in profit per WEEK last year. 4. But RBS made just £2m in the last quarter. Ouch. 5. Aldi is going to pay its staff £8.40 per hour – £1.20 more than the government’s National Living Wage. 6. As if it needed saying, London’s housing market is at serious risk of becoming a bubble. 7. VW’s loss is Toyota’s gain. 8. For investors in BA owner IAG, even a 38% profit boost isn’t enough. 9. Leaving the EU could trigger a double downgrade of Britain’s AAA credit rating. 10. It looks like the price of oil could be seriously low for some time yet.